Benajmin Franklin and his son, William, experimenting with lightning. Photo by Hulton Archive/Getty Images. Today is the birthday of one of the most instrumental figures in the development of electricity--Benjamin Franklin. During Franklin's time in the 1700s, electricity was seen as a source of amusement rather than something that serves a practical purpose. Two of his most recognized achievements are his experiment with lightning and the invention of the lightning rod. Franklin, as well as others, observed that lightning and electricity had many similar properties, such as light emission and attraction to metal. 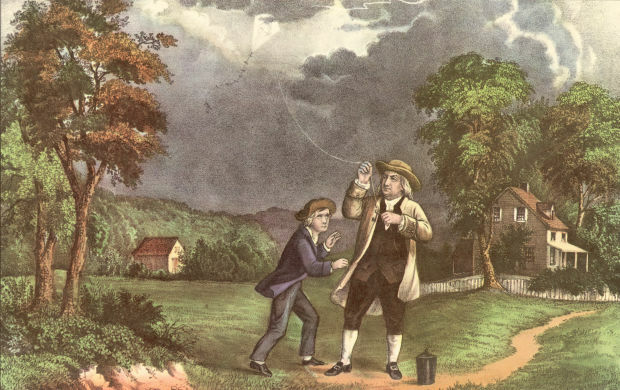 He sought to prove that they were the same thing by using a kite to attract lightning. During a thunderstorm, he tied a key to a kite string and noticed that the fibers on the string stood up. Also, touching the key caused a spark. From these observations, he concluded that electricity was present in the air. Franklin used his findings to install a rod at the top of a house which absorbs lightning while the house remains unaffected. Also among his inventions are bifocal lenses, swim fins, and an instrument called the glass armonica.